One of the biggest benefits of eating pomegranate seeds with diabetes is their low glycemic index value. Pomegranates are typically high in carbohydrates and most of these carbohydrates are actually sugars. But they are also a good source of dietary fiber which actually limits their effects on blood sugar. As such, they are actually a good choice of a fruit for diabetics because they don’t raise blood sugar very much, making them a low-glycemic fruit. Still, despite their beneficial glycemic effects, they are best consumed in reasonable amounts, as part of a healthy, varied and balanced diet. The glycemic index (GI) is a numerical scale that measures how fast the carbohydrates in a food raise blood sugar levels. The scale goes from 0 to 100, the value 100 being assigned to pure glucose. Below 55 is a low GI. Between 56-69 is a moderate GI. Between 70-100 is a high GI. For diabetics and anyone looking to manage their blood sugar, foods with as low a GI as possible are preferable. In foods with a low GI, the sugar obtained from the digestion of carbohydrates is released slowly into the bloodstream. This causes a slower, steadier rise in blood sugar levels and allows the diabetic patient better control over their condition. The glycemic index of pomegranate seeds is estimated at 53, which is low, making pomegranate a low glycemic food. What this means is that eating pomegranate shouldn’t affect blood sugar too much because the sugar obtained from the carbohydrates in it is released slowly into the bloodstream, causing a gradual increase. However, not all pomegranates have the exact same glycemic index score. Sweeter varieties, riper fruit may be slightly higher on the GI scale. Less sweet varieties, less ripe fruit may be slightly lower on the GI scale. For example, a typical pomegranate, sweet and ripe, has a GI score of around 53 (low). At the same time, less sweet varieties and less ripe fruit may hold a GI score as low as 35. And while neither should affect blood sugar too much, it is clear that the lower the GI value, the lesser the effects on blood sugar. Of course, this doesn’t mean you can just eat as much pomegranate as you want at once, especially if you’re diabetic or needing to manage your blood sugar. Also see Can You Eat Pomegranate With Diabetes? But just because a food is low on the GI scale, that doesn’t mean you can fill up on it. If you are looking to manage your blood sugar, then you have to also take into account portion size. The glycemic load (GL) considers the effects on blood sugar of foods based on how much you eat at once/portion size. In other words, the type and amount of carbohydrates in a given serving of a food will determine effects on blood sugar. Technically, the lower your intake/the lower the portion size, the less carbohydrates you are getting and the lesser the effects on blood sugar. Below 10 is a low glycemic load (GL). Between 11-19 is a moderate GL. Over 20 is a high GL. Ideally, diabetics and anyone looking to manage their blood sugar should choose foods with lower GL values. The GL is determined based on the following formula: GI X number of carbohydrates in a serving (expressed in grams)/100. The glycemic load of 100 g of pomegranate seeds is 9.9, estimated at 10 (moderate). The glycemic load of a cup of pomegranate seeds with an estimated weight of 87 g is 8.6, estimated at 9 (low). The glycemic load of 50 g of pomegranate seeds is 4.95, estimated at 5 (low). How many carbs in pomegranate? 100 g of pomegranate seeds has 18.7 g of carbohydrates, of which 13.67 g are sugars, 4 g dietary fiber and about 1 g other digestible carbs. A cup of pomegranate seeds (estimated weight: 87 g) has 16.27 g of carbohydrates, of which 11.89 g are sugars, 3.5 g dietary fiber and 0.88 g other digestible carbs. 50 g of pomegranate seeds has 9.35 g of carbohydrates, of which 6.8 g sugars, 2 g dietary fiber and 0.5 g other digestible carbs. 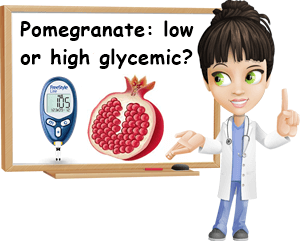 Knowing how many carbohydrates are in pomegranate is important because it helps you determine the glycemic load of various portions of the fruit and estimate their effects on blood sugar. However, even with low glycemic index and load scores, pomegranates are only good for diabetes if you keep to a moderate, reasonable intake that is in accordance to your individual nutritional requirements. With diabetes, whether type 2 or type 2, excesses are never a good idea. Eating too much in one sitting, especially separate from other foods, can easily lead to an accumulation of carbohydrates that could then make blood sugar go up too high too fast. 1) Choose fruits with as low a GI as possible, including apples, pears, cherries or pomegranate. 2) Have small servings at once, preferably no more than one serving of a certain fruit per day. 3) When it comes to foods that could raise your blood sugar significantly, don’t eat them too frequently, especially not every single day. 4) Don’t have fruits on an empty stomach, before a meal or as a snack, independent from other foods. 5) Pair fruits with sources of fat and protein, whether it’s walnuts, almonds, sunflower seeds, pumpkin seeds or peanut butter, eggs, lean chicken or cheese. 6) Know how much of the important nutrients you are getting in your serving of fruit: carbohydrates, sugars, fiber, calories (pomegranate seeds have only 83 kcal per 100 g, 72 kcal per 87 g cup, 41.5 kcal per 50 g). 7) Plan your meals so that you may enjoy both balance and variety in your diet and get the nutrition you need on a daily basis. 8) Most important, if you don’t feel good after eating something, discontinue consumption. What may be good for others doesn’t necessarily have to be good for you too. There are plenty of options out there to choose from, so don’t get stuck on a food just because it seems to work for others.